Monday  After joining the coach from your taxis, we head to the beautiful Evenlode Valley in the Cotswolds and the market town of Morton in Marsh, complete with chocolate box houses we will spend lunchtime here before continuing to our hotel. We have included tea/coffee and cake on our arrival while your cases are delivered to your rooms. Time to relax before tonights dinner. 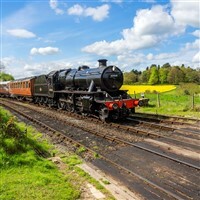 Tuesday  Today we take the short trip to Kidderminster for a scenic journey on the Severn Valley Railway. The train meanders through the Shropshire countryside to the market town of Bridgnorth where we will have free time for lunch. We continue in the coach this afternoon to the RAF museum Cosford. Home to over 70 aircraft of international importance and adjacent to an active airfield, we include a guided tour to bring the exhibitions to life. Wednesday  Today we travel to Shrewsbury. This pretty town of black and white buildings and cobbled street was the first home of Charles Darwin. We will enjoy a relaxing cruise with tea and coffee included sailing around the picturesque River Severn Loop from Victoria quay. This afternoon we continue to Ludlow, Shropshires Food and Drink capital! Thursday  Today we enjoy a scenic drive through the Shropshire Hills with a lunchtime stop at the historic market town of Church Stretton in the heart of the Shropshire Hills, an area of outstanding natural beauty on the English Welsh border. We return to the hotel this afternoon for free time to relax and enjoy the grounds and leisure facilities at our hotel. Friday  Homeward bound today, but not before a visit to the Jinney Ring Craft Centre near Worcester. This centre, set in lovely gardens with wide views over the Malvern Hills gives you the opportunity to watch skilled craftsmen and artists at work, as well as a chance to pick up an unusual gift from their quirky gift shop. We continue south to Wiltshire after a memorable holiday to your waiting taxis. This 4* hotel is a country house set amongst 23 acres of beautiful grounds with extensive leisure facilities including an indoor pool and gym. All bedrooms are en-suite with complimentary toiletries, hospitality trays, TV, free Wi-Fi and 24hr room service.